It does live up to expectations of a saga. As this story slowly unravels and balances the first person narration and mostly third person narration so incredibly well. The main narrator of the entire story is Esteban, who at times disgust me of the way he thought that Clara was his. And that she should be willing to share everything with him. As for Clara, in her own right, she is a strong woman. She would put her foot down and leave him, which she does in this book for her own daughter. The way that she is always so incredibly wise and aware of the world, and how she is portrayed is like a clairvoyant sometimes. Where she doesn’t try to speak. 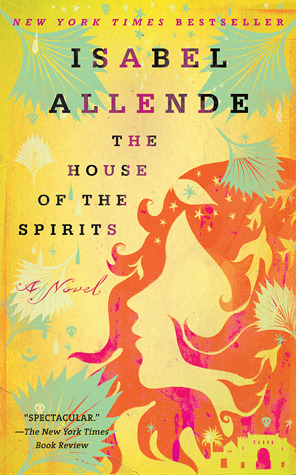 And her abilities really quite magical, and the way it is presented places this book into magical realism. Where sometimes certain events barely have any explanation, and this does pass due to the way Clara appears so incredibly aware. As for the family, which they are all rather crazy. Esteban with his obsession with Rosa and became a reason why he married Clara in the first place. Clara with all her abilities yet choosing not to interfere in many of her fates. Blanca, and her eventual life working hard and doing what she likes. All the while giving birth to a daughter. And Jaime and Nicolas, both of which finds their own strange path. Nicolas moving from one point to another without much thought, Jaime and his constant need for helping the poor. I really liked how their entire family became part of politics eventually. Such as Esteban running as a conservative, Jaime standing on the opposition side. As for eventually what happens to Alba and her, I would say that another party has come into power and one that is indeed a cruel tyrant. As for the story slowly beginning and ending, it all ends with Alba. And this saga has been quite entertaining really. Such as Clara deciding once and for all leaving, even though they still kept up appearances. Blanca and her affair, Jaime and Nicolas where both their paths diverged so incredibly much. And Alba, who grew up in this ridiculous environment. So, this is a good book. More in the part that it developed characters over the years, and yet still kept their essence in the way that I could still recognize them. All the while spanning years and years with three generations of the family. And well, this books handles it all well. With how bizarre some of them are, and eventually having Esteban realise that he on some level had faulted. And Blanca deciding to let her first love go, after seeing that he was unwilling to be chained to her. And the way Alba views the world at the end. I would say that all this took a lot of work and planning, given how each character eventually had their own role to play and their own role to fulfill. And even seeing Esteban begging on his knees was nice indeed, and the way that he simply wants Alba back is really heartwarming too. So this is a family saga, and centered about their entire family and lives. And the way that somehow a lot of things eventually come back to them, and a lot of times there aren’t a lot of answers seeing as how Alba changed, and how mysterious she was at the epilogue. So, I would say that this book is more about the family than anything else. And each character was handled well for me, at least within the Trueban family. One of my favorites. Another Latin American book with a similar epic feel is In the Time of the Butterflies.